Five years ago on our wedding day, my Mom joked that we didn't need many flowers for decoration at the church--we'd be decorating with priests. The priests joked that they didn't know if they were attending an ordination or a wedding. They also joked that with so many priests witnessing our nuptials, there'd be no way out of it for me or Sean--that was one valid, valid, VALID marital sacrament. True enough. What this picture omits is that to the right of the altar stand four more priests (plus one seminarian, our master of ceremonies). So that makes a total of eight priests, one deacon and one acolyte who processed in for our wedding. I cannot believe it was five years ago, and that that girl in the picture now chases little boys all the day long. God is good. Later this month we'll be doing a dinner/date night to celebrate our anniversary and staying the night at fancy-schmancy hotel. It will be my first night ever away from either of the boys. I've promised Sean to only cry when I leave them. Then during the salad course. Possibly again over dessert and definitely as I'm falling asleep. Then when I get to sleep through the night and wake up bright-eyed and bushy-tailed around 8 a.m., I should be good. Joining in the CookieCott? I am. This week an apologist at Catholic Answers wrote a post admonishing pro-life folks for this boycott, suggesting they end their thick-headed ways and just give money to local troops instead. I'm a big fan of Catholic Answers and we support them financially, but man. No thank you. I left a comment on the article explaining my position, which I don't normally do. And in the future, I'd prefer their apologists publish their opinions without adding insults to the many pro-lifers who support their ministry. The Catholic Church couples its extraordinary moral demand with an extraordinarily lenient penitential system. Suppose the pilot of the plane that dropped the atomic bomb on Hiroshima (I believe he was a Catholic) came into a confessional box and, in an attitude of sincere repentance, confessed the sin of contributing to the deaths of 100,000 innocent people. 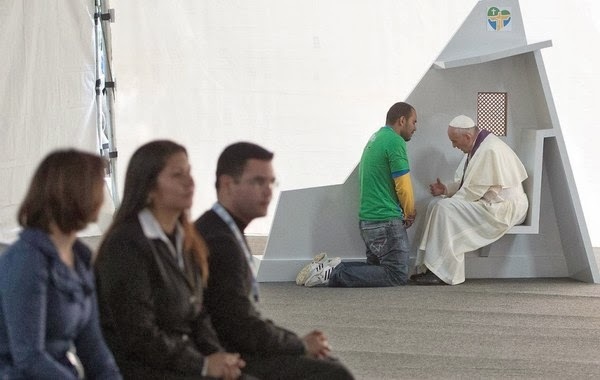 The priest would certainly give him counsel and perhaps assign a severe penance, but he would then say, "I absolve you of all your sins, in the name of the Father, and of the Son, and of the Holy Spirit." And that man's sins, before God, would be wiped away. Period. The Church calls people to be not spiritual mediocrities, but great saints, and this is why its moral ideals are so stringent. Snow days and high temperatures of a whole 10 degrees mean fun bubble times in the bathroom. I'm telling you, he was thrilled. I will spend my long, long time in purgatory shoveling snow. Or more precisely, shoveling show while it's still snowing and while keep two little boys from wandering out into the street. Give me housecleaning, give me dirty dishes and stock pots with last night's creamy pasta stuck on, give me all the ironing and washing and vacuuming and toilet cleaning. Spare me shoveling. To quote Gollum: We hates it. While shoveling today I was actually wondering if I'd rather be in labor or futilely pushing fluffy white stuff into piles that will probably be melted by rain in 24 hours but for now need to be pushed into said stupid piles. I haven't quite decided. But at least in labor you get drugs and a baby at the end. Happy wedding flowers from my beautiful February day five years ago. I wish that instead of taking the top tier of a wedding cake out of the freezer for anniversaries, we could freeze flowers instead, bringing them out every year just as fresh, soft and vibrant as they were on the blessed day. Ah well. Pictures will do. Now go read about Jen's painful moment with Patrick Madrid. 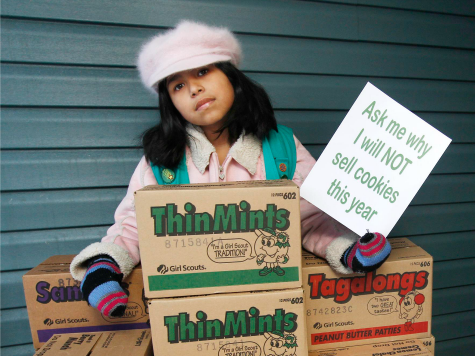 And yeah, we've been boycotting girl scout cookies for a few years because of these same issues - I remember there was a picture going around on facebook that a bunch of people were sharing saying, "Look, the girl scouts have ties to planned parenthood and blah blah blah but look, that's SO GREAT AND I LOVE IT!" 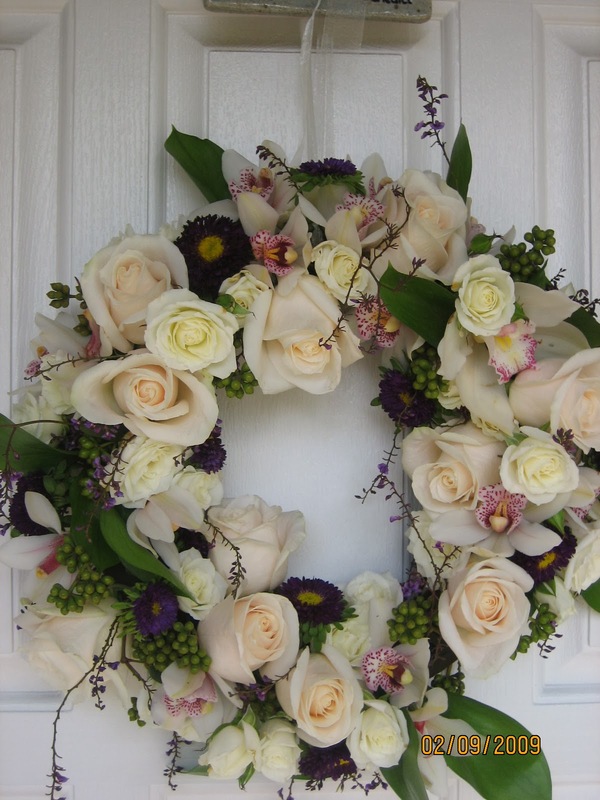 and I was like, "Right, kind of cements my position right here..."
What a beautiful flower wreath! And I'd love to know how you managed to get EIGHT priests to be at your wedding - that's got to be some sort of record. Won't you please do a post on that? We had 7 priests at our wedding...so you have us beat with eight!. Wow!! It's great having so many priests there.